Th-INK-ing of You: A Sneak Peek at some Preciousness!!! A Sneak Peek at some Preciousness!!! Hello friends! I hope you had an absolutely wonderful Christmas! We had a great time with our family. In spite of several being sick, it was a blessed time together with the ones we love! My daughter and I cooked up a storm and baked so much food you'd think we were feeding an army! I think I have gained a ton of weight, and I don't even want to get on the scale yet for fear of what I'll find! LOL! Anyway... we are now back home and today I got to play with new stamps! This card is a sneak peek at one of a BUNCH of awesome sets being released by Our Daily Bread designs on Jan. 1! 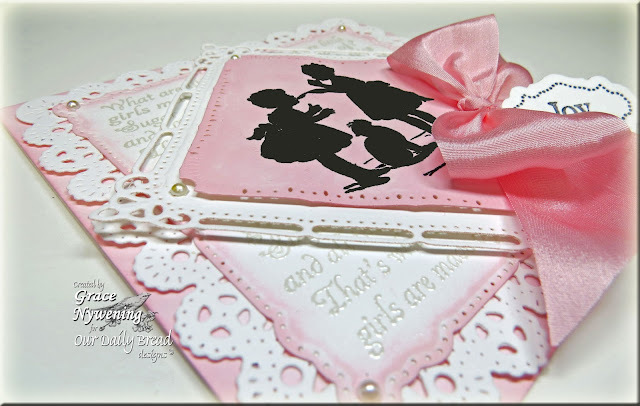 The sweet image is from a set called "Little Girls", and the tag uses one of the "Faith Words" and the Antique Label Designs" as well as the custom die made for ODBD by Spellbinders. I wanted to play along in today's Free4All on SCS, which was "Emboss Resist", so I decided this image would be perfect heat embossed in black. I then sponged Distress Ink in Spun Sugar all over the panel. I then heat embossed one of the sentiments (What little Girls are made of) in pearl embossing powder for my background layer, and sponged the edges. The first three dies are Spellbinders Marvelous Squares, and the bottom die is Cheery Lynn Dutch Scallop Square. Everything is on white card stock and all color is from sponging. The finished size is 4 3/4" square. I finished off with a pretty May Arts silk bow and some pearls. I hope I've wetted your appetite because seriously, this release is over the top! There is so much variety coming... and you will love it all! Don't miss the hop on Jan 1 and maybe you'll win some!!! Grace this is so beautiful - love the stamps and the way you have used them! What a fabulous card Grace. Love the design and love the adorable image. Hi Grace, It's always such a treat to stop by and see your delightful creations. This darling silhouette stamp is a MUST-HAVE. So precious! And don't worry, my dear friend, we have all packed on a few pounds. I know that I will be hitting the pool starting Monday morning, and getting back into my "good girl routine" again. Thanks for sharing this darling card with us! Wow, it sure is lovely. A beautiful card Grace - the silhouette image looks wonderful on the pink and white background layers. Thank you so much for entering our Pink and Pearlie challenge at ITP - good luck, and I hope you will join us again in the New Year. What a beautiful card. Love the design and colors, and the sweet image. You can sure say that again Grace...this is MOST PRECIOUS!! what fantastic images Kelley keeps coming out with! !...and did you ever do this one up proud!! This is such a beautiful card! Love the silhouette image and the lovely details of punches and die cuts too. The paper with scripture makes a great background for this card! Wow, just awesome!! I love the design, the die cuts used, the paper piercing, and the silhouettes are just perfect for the card. Thanks so much for sharing and joining us at Link Up for Pink. Good luck in the draw. Nice take on the challenge.... Thank you for joining us at Stampotique Designers Challenge this week. This is a stunning silhouette image... which makes a fabulous card. I love the layers and shapes you've used too. Thank you for sharing with us at In The Pink... hope to see you here again soon! So cute! I adore this image sooo much! Love it. Wow!!! Gorgeous, lovin' that darling silhouette!!!! Thanks for joining us for challenge #8 at LUFP!! For the Love of ODBD All time BEST SELLERS Hop! Snowflakes Everywhere.. but not here!